Over one hundred thousand copies of The Jump Manual have been sold over the past decade. In fact, Jacob Hiller's Jump Manual remains one of the most popular jump programs of 2019. So, what makes the Jump Manual the best selling jump program of all-time? Does The Jump Manual get the results it claims? Can it really help you learn how to jump higher? I will answer all those questions and more as we take a look inside the latest version in this comprehensive review of The Jump Manual. The Jump Manual is a comprehensive 12 week jump program that guarantees significant enhancement of your vertical jump (gains of 10 inches in 12 weeks). The Jump Manual includes a combination of both written and video content covering everything from jump techniques, nutrition, strength & plyometric training, recovery techniques plus much more. We currently rank The Jump Manual the #1 jump program out of all the jump programs we have reviewed. due it's comprehensive training protocol and exceptional value for money. 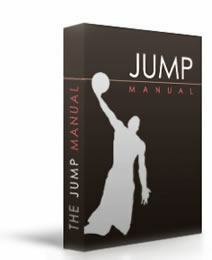 The Jump Manual was originally created by world renowned vertical jump trainer Jacob Hiller way back in 2008. When I first got my hands on a copy of the program in 2012 it was in the form of a bland downloadable PDF. The Jump Manual was the standalone vertical jump training program of the time. The content included was pure gold for a teenager like me. At that time of my life I was obsessed with learning how to increase vertical jump height so that I could achieve a school scholarship for basketball. This program was my introduction to jump training and where my obsession with dunking began. I followed the plan and improved my jump by around 10 inches that summer of 2012. The Jump Manual had me in the gym lifting heavy weights so I also packed on a heap of muscle mass. Looking back I realised that if I would have put more focus on nutrition and staying lean my vertical jump improvements would have likely been much higher. (Note: Nutrition is now covered in great detail within the latest version of The Jump Manual). The Jump Manual definitely holds a special place in my heart. Over the years my jump training evolved. Over the past decade I have used other jump programs such as body-weight only options like Vert Shock, strength protocols like 5 x 5 strong lifts and everything in between. 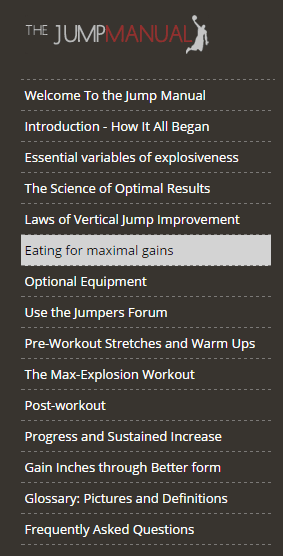 Nothing got results like the initial "noob gains" I got from my 12 weeks on The Jump Manual back in the day. 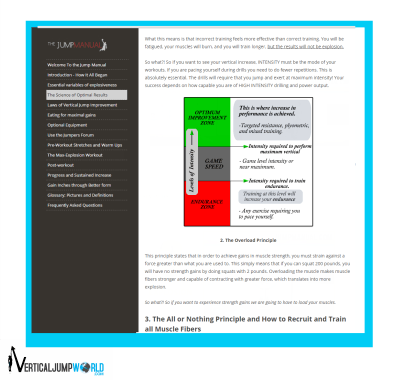 I decided it was time to revisit The Jump Manual and undertake a thorough review on behalf of the Vertical Jump World community. I purchased the new and improved online Jump Manual system and fired it up. On first impression I was extremely impressed with the quality content upgrades that have been included. The creator of The Jump Manual Jacob Hiller, has collated some his customers most noteworthy testimonials from over the past decade. As you will see there are some very impressive results. If you are wondering what sort of results are possible with a 12 week hybrid jump training program (weights + plyometrics) then make sure you take a look. What Will I Learn In This Jump Manual Review? What Does It Look Like Inside The Jump Manual Program? How Often Will I Need To Train On The Jump Manual? What Results Can I Expect From The Jump Manual Program? Is Jacob ﻿Hiller's ﻿All-Time Best Selling Jump ﻿﻿﻿Program ﻿﻿﻿Still Relevant Today? Where To Buy The Jump Manual? Options For More Complex Progressions In The Future To Reduce Plateaus & Ensure Ongoing Jump Gains. Some videos feel a little outdated (the content is great though!). Requires Access To Weights/Gym In Order To Optimize Results. Body-Weight Only Variations Will Likely Lead Less Significant Results. If You Don't Have Access To Weight Training Equipment You May Be Better Off Considering Vert Shock. Background music can get a little annoying with repeated viewing. Some Of The Older Information Could Be Removed To Make The Newer Information Easier To Follow. 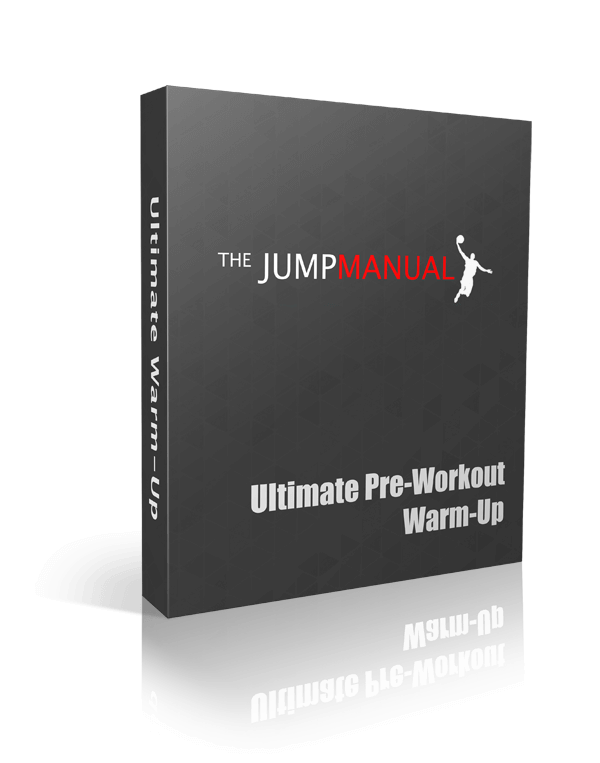 In this Jump Manual review I will show exactly what you will receive when you purchase the program (plus bonus gift roundup). I will also take you for a look through the post purchase member area so you can see the full contents of the The Jump Manual program for yourself. I will show you what sort of vertical jump results are possible if you adhere to The Jump Manual protocol for 12 weeks. Simply put, my goal is to make this the most thorough Jump Manual review online. I have covered everything you need to know, so that if you are deciding to purchase the Jump Manual, you can do so with confidence. 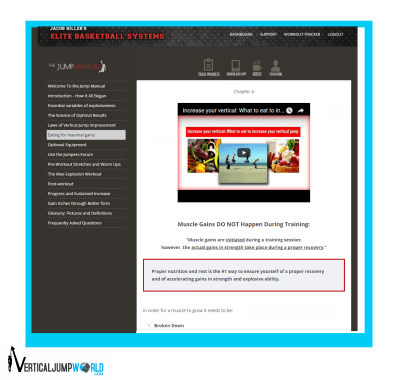 Once you purchase the program you will gain direct access to the interactive jump system. Yep, you can get started today with the ability to download the full system instantly. The Jump Manual contains 12 chapters of absolutely everything you will need to know in order to increase your vertical jump (Well, of course you still have to do the hard work!). 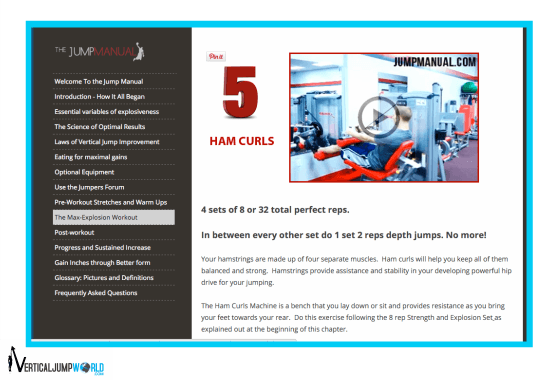 Below you will see a few screen shots I took which display the overall layout of the Jump Manual program. Although the program design is not as slick and high tech as ​some of the other programs we have reviewed, it is very easy to navigate, follow and understand, as you will see below. I would like to see Jacob Hiller give this program design a bit of a freshen up so that the look can match the the quality of the content he provides. 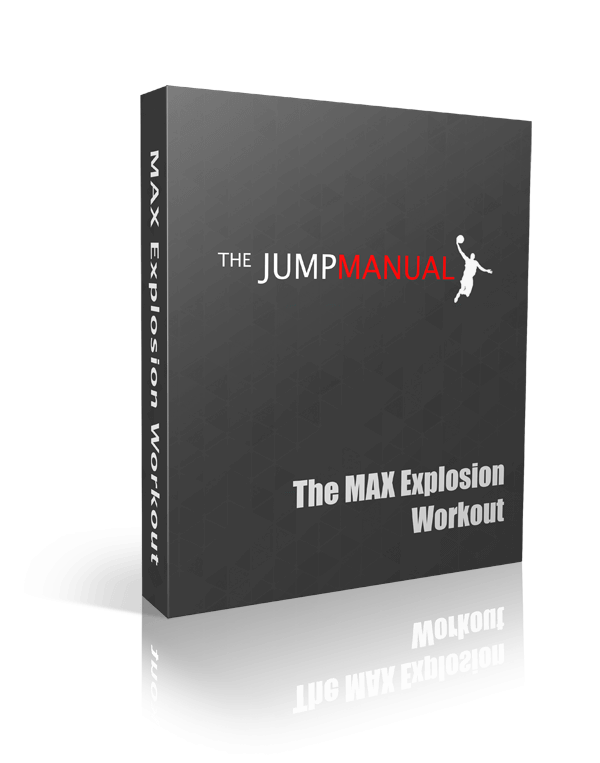 The Jump Manual workouts are fittingly named the "max explosion workouts" which are programmed in 2-week cycles that train specific components of the vertical jump. The program is designed to be completed in 12 weeks, however the cyclic nature of the program allows you to continue to develop your jump for as long as you like (we definitely recommend to take a week off before repeating another 12 week cycle to assist recovery of nervous system). This workout focuses on explosiveness. Exercises in these workouts include plyometric exercises and other jumping movements. Resistance is also added to really get those muscle fibres firing. The emphasis placed on lifting weights for vertical jump optimisation is a vital addition that sets The Jump Manual apart from other jump programs. Many other popular programs focus more on explosive shock training based body-weight exercises, as opposed to The Jump Manual heavily emphasises resistance based exercises in combination with plyometric exercise. This workout is named the core series. Yep, you guessed it! This component focuses on a range of exercises that are designed to strengthen the core. Jacob explains why core training is often an overlooked component in many popular jump programs. He explains how this links the upper and lower limbs to maximize jump bio-mechanics while also improving stability and reducing injury risk. This workout sees the participant lifting some serious weights and participating in the most well prescribed variety of vertical jump exercises we have seen included in a jump training system. Be prepared to perform squats, deadlifts and other strength exercises that will get you stronger than ever before. Of course lifting comes with a great risk of injury. Jacob does a nice job of explaining every exercise to ensure you do them effectively and safely. These weight exercises will not only improve your vertical jump but will also dramatically help other strength based aspects of your sport (for example boxing out and rebounding in basketball). These are your “off day” recovery exercises. On these days you will work on stretching to increase your vertical jump height by enhancing flexibility and mobility, while also performing some light jumps to keep the tendons firing. Important: If you are thinking about undertaking The Jump Manual during your sporting season be prepared to deal with delayed onset muscle soreness (DOMS) from the heavy lifting. You know that pain when you cant sit down after a heavy leg day due to extreme muscle pain. This can really affect performance in some cases so it is definitely something to consider. If you believe this may be an issue for you it may be a wiser choice to select a quality jump program that doesn’t focus on so much heavy lifting yet still guarantees results. We recommend V﻿﻿ert ﻿﻿Shock by Adam Folker in this case as it tends to produce less overall DOMS. However, it is important to note that the potential for maximum vert gains is much higher when a weight training component is included like it is in The Jump Manual. >>You can learn more about Jacob Hiller and The Jump Manual over at the official website. Workouts 1,3 and 4 are performed once per week while the core series is performed on twice per week. So be prepared to workout at least 5 days per week with some light stretching on most days. The Jump Manual guarantees an increase of 10 inches in vertical jump height in 12 weeks or your money back. I love it when jump program developers like Jacob Hiller stand behind their programs by offering such a generous guarantee. 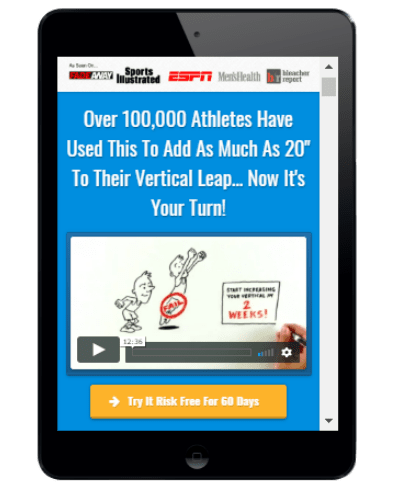 This guarantee makes The Jump Manual a great low risk opportunity for those of you who are looking to improve your vertical jumping ability this year. Mr Jacob Hiller's vast jump training experience shines through in The Jump Manual. The science based vertical jump enhancement principles included have been proven to work for over a decade. Basically, The Jump Manual contains all of the information you need to add inches to your jump height over a matter of weeks. Unfortunately, The Jump Manual feels a little outdated and lacks the engaging features which we have come to expect in the new era of jump programs. In this day and age we want content that bright and shiny. Sometimes the Jump Manual feels a little dull when compared to other jump programs. However, the quality of the content included makes up for it's shortcomings in design. Hopefully The Jump Manual will undergo another presentation focused update sometime in the near future. The Jump Manual is a comprehensive 12 week vertical jump program that guarantees significant enhancement of your vertical jump or your money back. 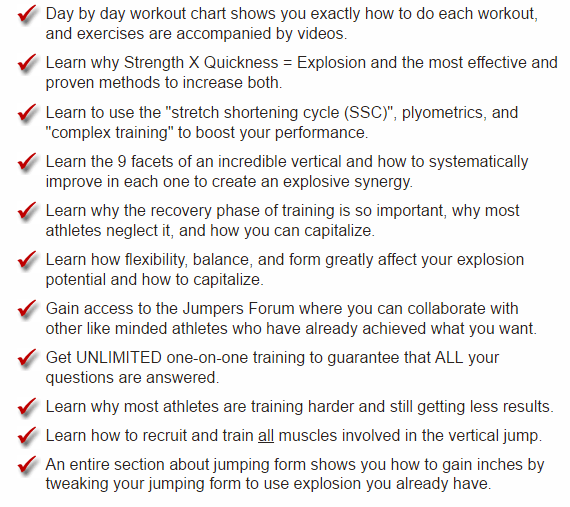 The Jump Manual includes a combination of both written and video content covering everything from jump techniques, nutrition, strength/plyometric training, recovery techniques plus much more. It is always best to test your vertical jump height before starting to get a baseline measure before starting any jump training protocol. 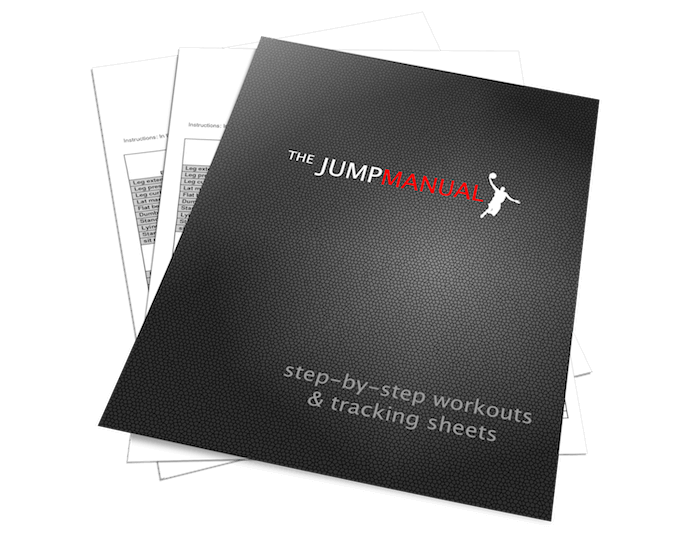 The Jump Manual provides a way to track your progress which is a very helpful addition that many other programs seem to neglect. It is also important to note that if you want to get the most out of The Jump Manual you will require some vertical jump training equipment such as dumbbells, barbells and a few resistance bands. This section outlines what Jacob Hiller considers essential to developing explosiveness. There are 9 variables which he states must be followed in order to achieve ones vertical jump potential. I have listed all of these 9 areas further along in this post for you to check out. Jacob Hiller does a fantastic job of justifying the vertical jump training principles incorporated in the program for the most part. However, at one stage he states that muscle fiber type can’t be changed. Science has now proven Jacob's statement to be wrong. Please take a read of this great research article if you would like to learn more about how specific training can change muscle fiber type. The aforementioned research article states that "possible variables that may increase type II fibers and decrease type I fibers ... include high velocity isokinetic contractions; ballistic movements such as bench press throws and sprints”. So what does this mean if you decide to follow the Jump Manual? 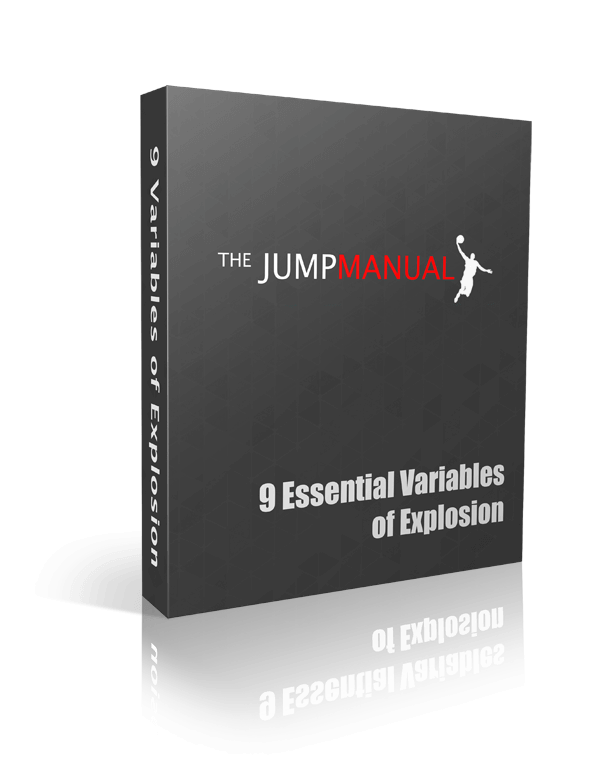 Basically The Jump Manual will provide you with the stimulus required to increase fast twitch fibers and help boost your jumping ability fast. Sure it won't happen overnight but overtime you will slowly and surely become a more explosive athlete at a sub-cellular level. In this section Jacob Hiller delves deeper into the justification of his exercises prescription protocols. Unfortunately, although what he is saying is spot on most of the time he fails to cite many credible sources which would help increase the credibility of his statements. Jacob Hiller is a very knowledgeable and qualified trainer. It seems as though he has relied on his own knowledge and expertise rather than feel the need to justify every reference every comment made. For example, he states that all lifts should be undertaken at 85% of your one rep max. This information is perfectly fine and will help you on your journey to a higher vertical. However when undertaking our Jump Manual review we would have like to see some evidence to back up claims such as this. Jacob Hiller obviously studies the literature and simply couldn’t be bothered to cite references on topics like this. However, it is also very important to consider that studies have shown that novice trainers adapt much more quickly and will only need to train at around 60% of one rep max to see optimal strength gains. Jacob does indeed address this interesting scientific fact in a roundabout way by suggesting that inexperienced lifters should undertake lower load higher rep training. If you are a beginner or intermediate athlete you will most likely derive great benefits from training at 85% of max load. Experienced lifters may eventually plateau out on the program. But hey, this is a nice problem to have as by this stage you will likely have a 35+ inch vertical jump. Jacob Hiller recommends that you follow the program for 12 weeks straight. After this time you can start the program again or contact Jacob Hiller to personality modify your program to progress you to an elite jumper. He follows his spiel on strength training up with some nice information on plyometric training. He then gets into a very brief section on complex training. His attention to detail in these areas is a major reason why we think it is still the best jump program on the market, even though it's presentation is a little outdated. >>You can get started by downloading the program from the official website. In these sections Jacob Hiller disperses some fantastic information on topics such as nutrition, body composition, recovery and many other helpful things. You can read more about these features below. In this tab Jacob discusses the importance of optimizing the penultimate step. He does a great job of describing how to lengthen the penultimate step and lower your center of gravity to optimize jump height. One thing that we noticed in our Jump Manual review process was that a little too much emphasis is placed on the benefits of stretching for vertical jump improvements. A recent scientific review revealed that too much static stretching can actually reduce power capabilities of the muscles. 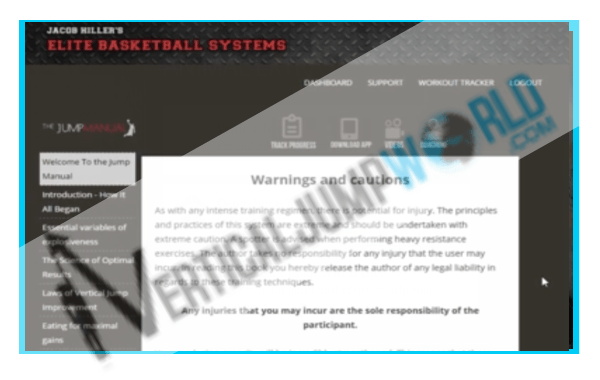 While undertaking our Jump Manual review we were pleased to see that it also contains info on commonly overlooked, yet important topics such as wearing the correct footwear for jumping higher, how to palm a basketball and how to overcome hereditary factors in order to jump higher. These handy tips are extremely helpful if you would one day like to learn how to dunk a basketball or spike a volleyball like the pros. This revolutionary jump program has developed a cult following partly thanks to the quality of the content, personalized coaching access and valuable bonus gifts. The program is a little more expensive than many other programs, but well worth the money. This vertical Jump Manual is created by professional strength and conditioning trainer Jacob Hiller. Mr Hiller is a certified vertical jump trainer with over a decade of experience including roles training NBA athletes vertical jump. Jacob Hiller (left) first developed the first versions of The Jump Manual way back in 2008. He hasn't stopped developing it, and continues to add more value to the program each year. When undertaking this Jump Manual review I was very pleased to see that Mr Hiller still walks the walk (or should we say jumps the jump) when it comes to vertical jump training. Mr Hiller has put his training principles to practice and has acquired an impressive vertical jump of 44” (Check Out This Video To See For Yourself). This dude can seriously get up with the best of them! His story is actually quite inspiring as he wasn't born a gifted athlete, but instead earned his impressive vertical jump through hard work, smart training. Mr Jacob Hillier and his jump program have been featured in many online and offline media publications such as ESPN, Sports Illustrated and Men's Health. Behind the scenes Mr Hiller is a dedicated family man who continually reinvests into his Jump Manual product in an attempt to keep it one step ahead of the rise of a new era of quality competition. Hillier continues to travel the world and coach athletes. He has visited over 22 countries and trains in 4 different languages. There is an abundance of inspiring Jump Manual before and after stories plasted all over the internet. Check out the links below to see some of these before and after stories for yourself. During the process of this Jump Manual review I was surprised to see even more valuable content upgrades added. It is the continual development of the program content and bonus products that ensures that The Jump Manual stays relevant in a market full of competitive programs. As you will see below, Jacob Hiller has endeavored to make the process of increasing your vertical jump as fool-proof as possible by covering every aspect of jump enhancement process in exquisite detail. I was very impressed by content of the exercise demos however the quality of production could be better. ​These videos can be viewed on a smartphone, tablet or desktop. Mr Hiller's personality shines through on these videos. He does a fantastic job explaining how to undertake the exercises in an effective and safe way while also inspiring and motivating you to get the most out of your sessions. If you are one of our valued readers you would know that we have reviewed over 30 jump programs. To my surprise the Jump Manual introduced me to a range of the best jumping exercises that I had never encountered before in any other program. These got me super pumped up to try and have now become some of my favorite go to jump exercises. The techniques included in the Jump Manual have been tested on thousands of athletes over the years and modified accordingly. The most recent version of the Jump Manual includes an amalgamation of Mr Hiller's experience over his past 12+ years of training professional athletes. 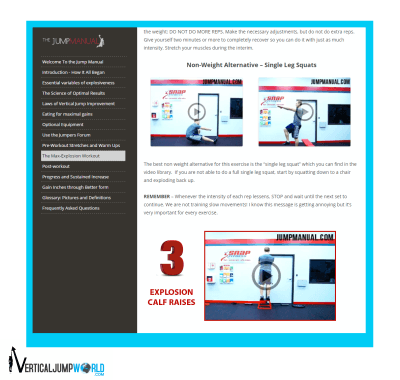 As you can see the Jump Manual covers every aspect of vertical jump enhancement process. Unlike other programs this one delves into important topics such as pre and post session nutrition, the scientific reasoning behind the protocols and how to obtain the correct mindset to ensure you achieve your set goals. One-on-one training is the only way to ensure that all your individual personal questions are answered so you can have 100% confidence in your training program. Jacob Hiller is by far the most generous of vertical jump experts in terms of sharing his knowledge with those who want to jump higher. This is a fantastic opportunity that is definitely worth the price of admission and then some when considering Mr Hillier's exorbitant one on one personal training prices. 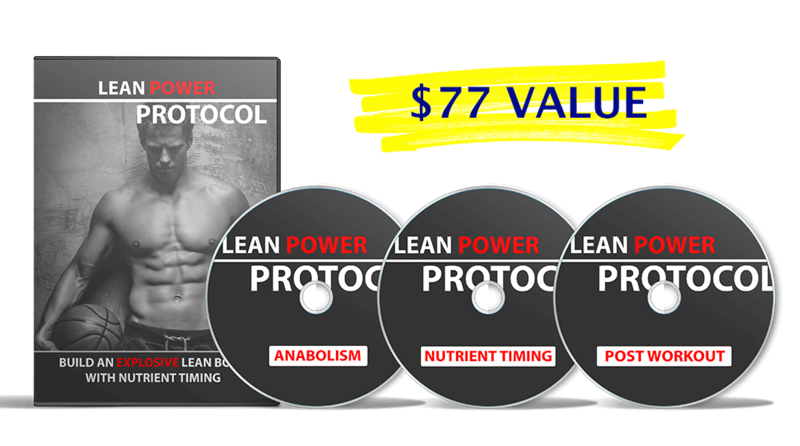 The Lean-Power-Protocol includes details on exactly what to eat and when to eat in order to optimize your vertical jump. Jacob Hiller has included some specific dietary protocols to help your muscles grow 20% faster. 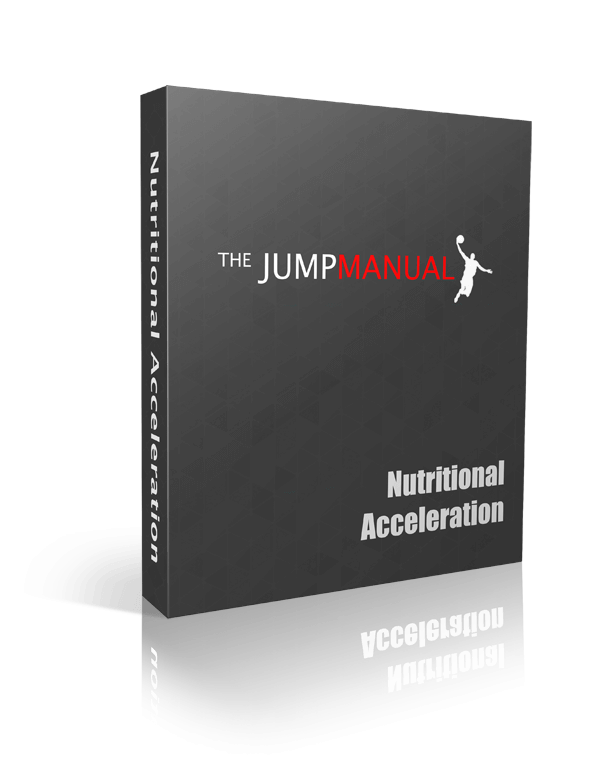 The nutritional Lean Power Protocol component of the The Jump Manual is a vital addition that covers important topics that many jump programs neglect. These powerful techniques will help you optimize your hormones allowing you to maximize lean mass and recover from your intense training sessions. Don't neglect the diet side of things when on a jump program or you will burn out. Trust me, it happens all the time to novice athletes. There are also some great tips that teach you how to torch the fat while gaining jump specific muscle mass and strength. Remember, the leaner you get the higher you will be able to jump assuming all other jump training variables stay the same. This very cool addition includes revolutionary techniques that you can apply to help you start increasing your vertical jump today. It includes simple yet often overlooked tips such as how to approach your jump correctly to instantly add 2 inches plus. 2 inches is quite a considerable increase in vertical jump height considering the 45 minutes of invested time. This manual also describes how to develop the correct motor patterning and tendon activation prior to contacting the ground so you can maximise power and explosion through ground contact. These supposedly exclusive techniques are nothing new to our team. These techniques are simply a rehash of the physiological principles of the stretch shortening cycle. However, the language and professional presentation makes it a treat to read, follow and apply. During my Jump Manual review I was introduced to the concept of how development of incorrect muscle memory can be detrimental to your vertical jump. I found these concepts to be quite innovative. Once again Mr Hiller has shown us why he has been the world's leading vertical jump trainer over the past 12+ years. In this section you will also find some great tips on how to maximize the electrical impulses that travel from the brain to the jumping muscles. To be more specific the impulses that travel through the central nervous system, into the peripheral nervous system which then finally innervate the motor neurons which control the “jumping muscles”. >>See the current bonus gift list at the official website. I give The Jump Manual a thumbs up and recommend it to our readers who want to improve their vertical jump. This is the perfect program for athletes who want to jump higher for basketball or volleyball. This program continues to innovate and lead the way in vertical jump information and resources. I was continually impressed throughout The Jump Manual review process by the fact Jacob Hiller has continued to add more and more value to the program over the past 10 years rather than be satisfied with his previous best selling versions. Unfortunately the presentation needs an urgent update. The current edition of The Jump Manual contains everything I expect to see in an all encompassing vertical jump program. The fact that Mr Hillier is now offering a 60 day money back guarantee so people can try it out for themselves in a low risk manner is a great incentive for novice jumpers to give it a go. Not only does the Jump Manual provide an abundance of proven exercise and nutrition protocols but also ​premium customer service and direct access to a world class professional trainer. There are other programs that come very close in all of our review criteria to the Jump Manual but ultimately this program still trumps most competition. Mr Hillier’s experience shines through on all of the included resources, whether written or video based. His NO BS approach is a breath of fresh air in a marketplace that is often over-hyped by under qualified trainers. Mr Hillier tells it like it is. He will tell you that the journey is not going to be easy. To get results you have to put in the work. He does however make the process reasonably simple to follow with this pro training package. Throughout our Jump Manual Review I was continually impressed by the vast scope and laser focused detail included the program. The Jump Manual leaves no stone unturned and thoroughly explains elements such as: strength, explosiveness, nerve recruitment, fuel, stability, form, flexibility, body composition, and genetic aspects. Every aspect that will affect your vertical jump has been covered in succinct detail. I also found the sport specific tips very helpful. I am sure you will too. Mr Jacob Hiller is a proven vertical jump professional who not only talks the talk but also walks the walk. His experience shines through in the Jump Manual. The fact that Mr Hiller offers a full 60 day warranty and promises that you will gain 10 inches on your vertical demonstrates that he has supreme confidence in his program. I love it when authors stand behind their product and wish it would happen more often among vertical jump program developers. Overall I am very confident to recommend the Jump Manual to our valued readers. Thousands of people around the world have had amazing success with the Jump Manual, perhaps you could be next. Thank you for taking the time to read our Jump Manual Review. We hope you found it helpful. Good luck on achieving a higher vertical jump. Put in the effort and you will get amazing results. Jacob Hiller's Jump Manual program is available for purchase as an instant download from the official website. All payments are processed through a secure payment system (McAffe and Norton Secure Protected). We hope that you found this Jump Manual review helpful. If you have any questions please don’t hesitate to ask. 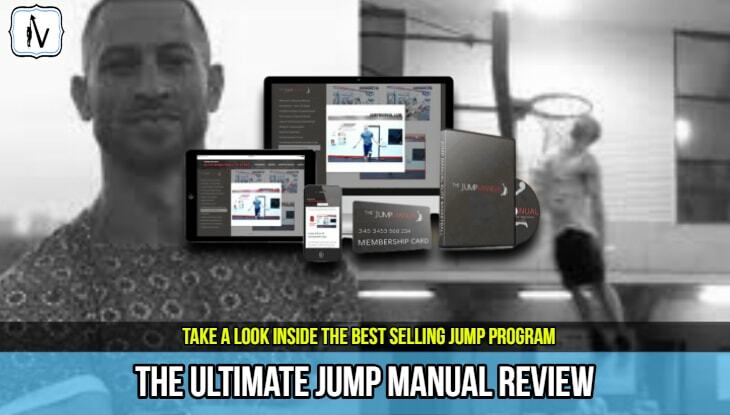 If you have had any experience with the Jump Manual program please comment below. We would love to hear your story. I’m sure our community readers would appreciate it too. Wilson, Jacob M., Jeremy P. Loenneke, Edward Jo, Gabriel J. Wilson, Michael C. Zourdos, and Jeong-Su Kim. “The Effects of Endurance, Strength, and Power Training on Muscle Fiber Type Shifting.” Journal of Strength and Conditioning Research 26.6 (2012): 1724-729. UPDATE: Since we have completed our review of the Jump Manual we have received many questions from our readers related to the Jump Manual program. Therefore we have decided to collate the most common questions we receive from our readers in the following F.A.Q list. We hope it helps answer any questions that we may not have answered in our Jump Manual Review above. DOES THE JUMP MANUAL REALLY WORK? Does the Jump Manual really work? Hell yes it does! We have tested it ourselves, put people through the program and have encountered many others who have shared their positive experience with the Jump Manual. Will the Jump Manual work for you? Well that depends if you will put in the effort required in every session as set out in the program. If you think you've got what it takes to see the program out then we are extremely confident that it will get you the results you desire. And remember, if you don't gain at least 10 inches in 12 weeks you can get your money back (but we honestly don't think you will need too). You can see results here. DOES THE JUMP MANUAL MAKE YOU FASTER? Does the Jump Manual make you faster? It sure can, but you will have to incorporate some sprints into your program to reap the rewards. Remember that the training principle of specificity is very important in increasing certain aspects of sport performance. For example if you want to jump higher you must jump more. If you want to run faster you must run more (at maximal intensity). The good thing is that there is a certain level of crossover between the training of the vertical jump and that of sprinting. The Jump Manual does a fantastic job of recruiting type 2 (fast-twitch) muscle fibres. These are the muscle fibres that make you both jump higher and run faster. Many people have reported speed improvements while on the Jump Manual program. At the end of the program you will likely to have improved in many other aspects of your fitness beyond vertical jump height and speed. So yes, the Jump Manual can make you faster plus much more. HOW LONG DOES THE JUMP MANUAL TAKE? How long does the Jump Manual take to complete? Well it takes exactly 3 months/12 weeks/84 days depending on which way you prefer to face the challenge ahead. We like to tick the days of on the calendar counting down from day 84. The best thing about the Jump Manual is that once you reach the end you can start all over again to gain even more height on your vertical. (Remember to give yourself a week off for recovery of the nervous system in between cycles!). IS THE JUMP MANUAL LEGIT? Is the Jump Manual legit? Yep, this program is as legit as they come. The product has been developed consistently over the past 8 years by an extremely well respected and experienced jump trainer (Jacob Hiller). 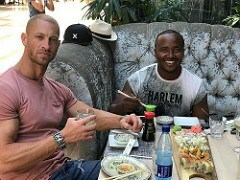 The program has been sold to over 100,000 happy customers worldwide. The payment system is secure, the support is class leading and the refund policy rock solid. Yep, the Jump Manual is definitely legit! IS THE JUMP MANUAL A DVD? Is the Jump Manual a DVD? No it is not. It is actually available for instant download (see button above) as a interactive e-book which features HD videos and other fancy web 2.0 properties. HOW MANY DAYS A WEEK IS THE JUMP MANUAL? Be prepared to workout at least 5 days per week with some light stretching undertaken on most days while on the program. Yes, it is a little overwhelming at first. And yes, you will be sore and tired. However, if you want to achieve an impressive vertical you must put in the work. Keep you eye on the prize and your passion intact and you will achieve greatness. IS THE JUMP MANUAL WORTH IT? The team here at Verticaljumpworld.com definitely think it is. So do thousands of satisfied customers from around the world. Ask yourself the question "would I pay $97 dollars to be able to one day throw down a massive dunk and make the crowd say HOOOOOOOO! ?" If you answered yes then the Jump Manual is definitely worth it. Not only will you be able to jump higher but you will also be stronger and faster than ever before. This increased athleticism has opened many doors for Jump Manual participants who have invested wisely in their physical development. HOW TALL IS JACOB HILLER? Jacob Hiller is 6ft tall to be exact. Oh, and many people also ask how old Jacob Hiller is.. He is actually 38 years old if you were wondering. So who is Jacob Hiller. Well first and foremost he is a dedicated father and loving husband. Secondly he is the mastermind behind the world's best selling jump program The Jump Manual. 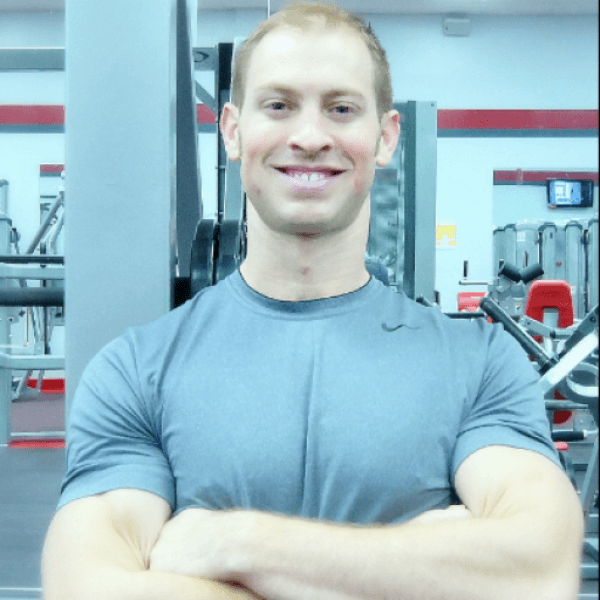 Jacob Hiller is a world renowned personal trainer who has assisted many NBA players and Olympic athletes to improve their vertical. Mr Hiller has achieved an impressive vertical jump of his own (44 inches) by applying the very same principles that he shares in the Jump Manual (see video above). WHERE CAN I GET THE JUMP MANUAL PDF FREE DOWNLOAD? Where can I get the Jump Manual Free PDF download you ask.. Well sorry but we can't help you there. We get so many people asking us what we think of using a free Jump Manual download crack that we unfortunately had to include it in our FAQ list. If you are looking to download the Jump Manual for free you will only end up disappointed. Yes. You may be able to find a free download of the much older version of the Jump Manual online, but who wants that severely outdated information. At the end of the day The Jump Manual only costs $67 which is very reasonable considering the quality of the content included. Plus, in the worst case scenario, if you don't get results they will give you your money back. If you are a real cheapskate you could buy it and send it back anyway even if it works. Bet you won't want to though after you see the results that you get. Trust us we've heard it all before. 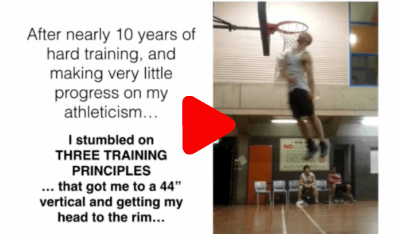 If you don't have the money to buy a vertical jump program, don't look for dodgy ways to get a poor quality version of The Jump Manual for free. Instead spend time browsing our blog to learn the fundamentals of jumping higher. Over time you can experiment with your own protocols based on a mish-mash of info from around the web. Sure downloading a program is more effective and efficient but sometimes the hard road can also be fruitful. SHOULD I PLAY BALL WHEN STARTING THE JUMP? Well, this is a tricky one...Ideally we think the Jump Manual is best undertaken in the pre-season. However, trained athletes respond well during the season. IS THE JUMP MANUAL A SCAM?/IS JACOB HILLER A SCAM ARTIST? No. These are such silly questions which are often perpetuated by sites trying to sell the Jump Manual through dodgy and manipulative marketing methods. The Jump Manual is a professionally polished program that has been created by a well respected vertical jump trainer. The program is also sold through one of the world's largest and most secure payment processing systems available to online merchants. DO YOU HAVE MORE ANY OF THE JUMP MANUAL TESTIMONIALS? No sorry. We don't have any more of the impressive Jump Manual before and after stories to share. However click the big red button above to be redirected to a page which will take you through a range of video testimonials that show the Jump Manual before and after stories in exquisite detail. JACOB HILLER VERTICAL JUMP. IS IT REALLY 44 INCHES? The Jacob Hiller vertical jump is somewhat of a legend. Yes, Jacob Hiller's vertical jump is 44", but what we don't understand is why this seems so hard to believe. You see the body is extremely adaptive and almost anyone can improve their jump height with the correct training stimulus. Jacob Hiller is an example of someone who put in the hard work to improve his vertical significantly. HOW MUCH TIME DO THE JUMP MANUAL WORKOUTS TAKE? Be prepared to spend about 5 hours spread across the 6 days of training week as a minimum. You also have the option to incorporate a few light recovery sessions as well. Where to buy the Jump Manual.. well, the official Jump Manual site of course. Not sure if The Jump Manual is the best choice for you? You can always compare the best jump programs on our roundup page. 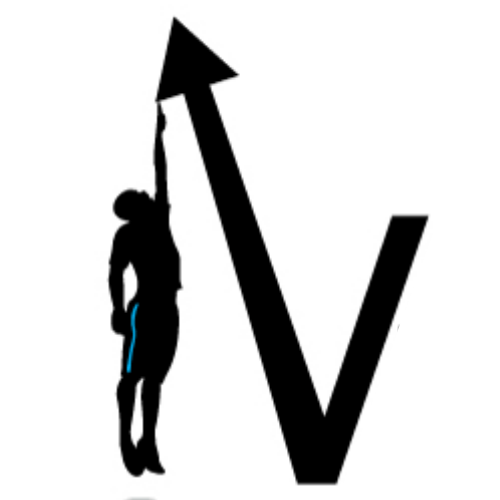 Vertical Jump World is the #1 online vertical jump training hub. Our team strive to continue to provide our valued readers with the best vertical jump related information, honest and comprehensive jump program reviews plus access to market leading jump training resources.